When I first came to the UK, I was here on a student work visa. I worked in a pub near Croydon and was taken out for my first real British Indian restaurant curry after my first shift. I was told to order the lamb vindaloo and I loved it! Growing up in California where Mexican food is very popular, I loved spicy food but I was not expecting the extreme heat that was introduced to me that evening. The flavours were new and exciting – like nothing I’d eaten before. That was many years ago but I still remember it like it was yesterday. It was the beginning of my love affair with British Indian restaurant (BIR) cuisine. Nowadays I make all the classic BIR meals at home so I am happy to be able to show you the king of them all: the lamb vindaloo. But first, a bit of vindaloo trivia. Authentic vindaloo curry owes its origins to Portuguese controlled Goa in the fifteenth century where the dish was served with pork meat. The name vindaloo was most likely a mispronounceation of the similar Portuguese dish carne de vinho e albos or meat with wine and garlic. Many UK Indian restaurant chefs add potatoes to their vindaloo curries. ‘Aloo’ means ‘potato’ in Hindi so a lot of the original self-taught Pakistani and Bangladeshi chefs mistakenly added potatoes to this fiery curry and it stuck. British Indian restaurant lamb vindaloo is not very similar to the authentic Goan version other than in name and that it is quite spicy. 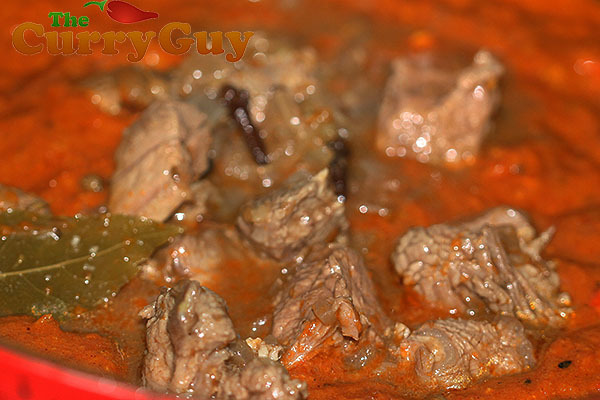 If you would like to read my authentic vindaloo recipe, please click here. This recipe is the result of trial and error and of course watching many great curry house chefs do their work. I’ve used both green chillies and also super hot scotch bonnet chillies. It is spicy but not over the top so. You can still taste and enjoy all the flavours. If you want yours even hotter, just add more chillies. That tends to do the job. By the way, I don’t add potatoes to my vindaloo curries but if you would like to, I recommend cooking them in the sauce until very tender. You might also like to make them ahead of time as many curry house chefs do. Here is a good recipe for doing this. 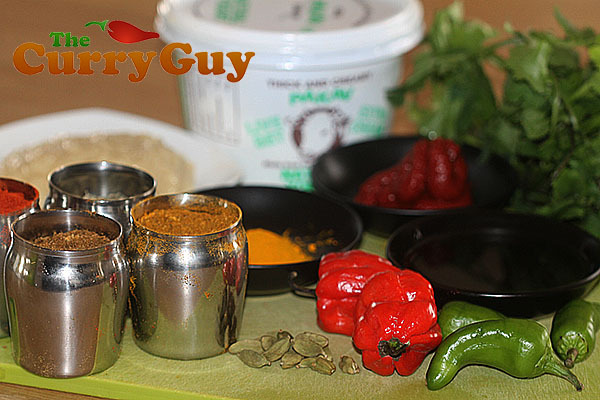 All of the authentic Indian restaurant style recipes on my blog call for a base curry sauce. There is a link for my base sauce below in the recipe. There cook my lamb for this recipe in two different ways. The most common way that it is cooked in restaurants is for the meat to be slowly stewed with spices. Here is my recipe for this method. You may also like to try a more tandoori style lamb. Here’s my tandoori lamb tikka recipe if you’d like to make tandoori lamb vindaloo. Heat the ghee. When bubbling, add the spices and stir. In go the chillies and tomato paste! 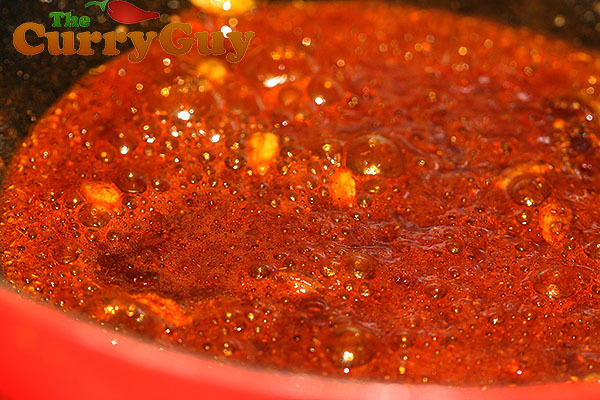 Stir in some heated base curry sauce. Stir in the yogurt one tablespoon at a time followed by the vinegar. Heat the ghee/vegetable oil over medium heat. Allow to sizzle for about a minute and then add the spicesc. The curry will darken as the turmeric fries away. Now scoop in the garlic and ginger along with the chopped chillies. Throw in the potatoes (if using) and the heated curry sauce. Stir to combine while adding the pre-cooked lamb pieces. Stir in the yogurt one tablespoon at a time followed by the vinegar and tomato paste. Check for seasoning and then sprinkle with the chopped coriander and season to taste with salt and pepper. 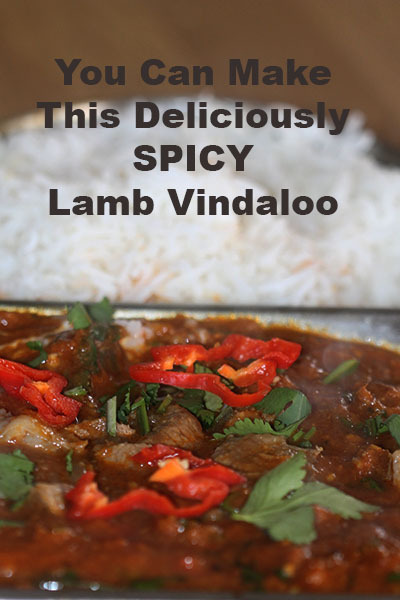 If you like the look of this lamb vindaloo, please be sure to share it with the share icons below. This recipe is simply brilliant. We’ve made lots of homemade curries – but this was probably the best. It’s a vindaloo, so it was hot, but that didn’t take away from the flavours. I recommend giving this a go. Thank you very much for that Martin. I’m really glad you liked it. i’ll be posting many more restaurant curries. Great to hear. I’m happy you’re enjoying the recipes. Hi Dan, you have saved my life! Thank you very much Gary for taking the time to comment. I’m really glad you liked the recipe. I have many more to share so please keep in touch. Delicious! Better than most takeaways. I have been searchign for years to find a Madras/vindaloo recipe to make my other half as we absolutely love indian takeaway. When I found this I wasn’t confident but thought I’d give it a whirl for easter. I must say that the whole thing came together at the end and tasted delicious, if not better than take out. My other half was so impressed that he wants me to make it again tonight so curry two nights in a row for us, but may ad prawns this time. Thank you for adding these recipes, as I said simply amazing! Was just curious as to what type of vinegar is used here? Malt vinegar, White vinegar etc? I use different types but usually white wine vinegar. What do you mean by 2 cups of curry sauce? Try about 500ml of curry sauce. It is a personal thing. 500ml is how I make it but you may prefer more or less. Experiment and have fun. I’m still confused lol. What do you mean by “curry sauce”? You listed 2 cups/500 ml of curry sauce as an ingredient. When I google curry sauce, I get recipes that are similar to your whole recipe. Was that a misprint, did you mean 500ml of water? Dan, you’re leaving me hangin here! Forrest, Dan means the ‘curry sauce’ that you would pre-make and add to the above recipe. 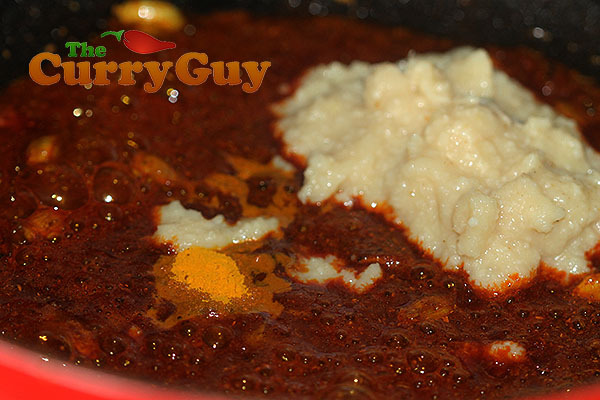 There is a link on this page above for both Large & Small batches of the curry sauce… Dan recommends the larger batch for a more authentic taste. Hope this helped. 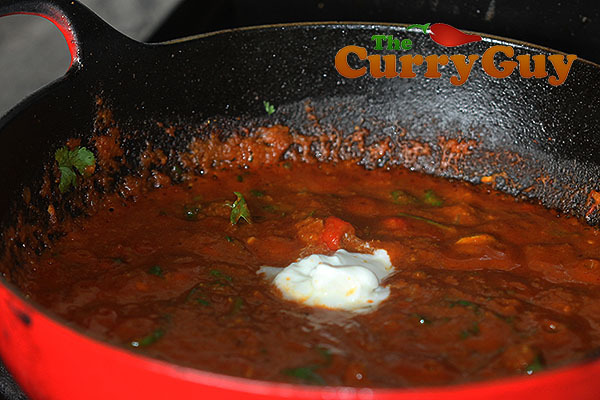 Simply brilliant, a nice hot curry that isn’t all heat. lots of flavour and smells delicious. This will now become part of the monthly dishes. Five stars from me. This recipe lacks the fundemental ingredient for Vindaloo…. The Vin part for vindaloo comes from the word WINE. It was originally a Portuguese dish of meat cooked in wine! What you have here is just a hot mosalla style curry recipe. Not a real vindaloo! 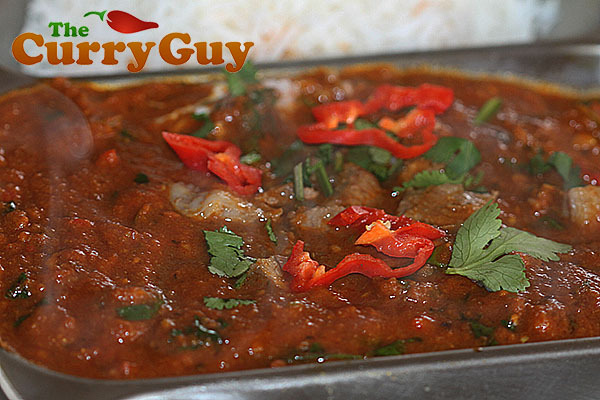 I have authentic pork vindaloo recipes on my site too. This is the British Indian restaurant version which is the same only in name. Wow… needed to find someone to check some of my homemade curry recipes… which I developed from my visits to Brazilian Pubs that served great BIR food (of which I am a huge fan). this is really good… and a great resource for my future curry adventures. thanks and let me know if you want to start a restaurant in Texas… they need curry here badly. Thank you very much Kelly. I’m really glad you liked the recipe. Would love to visit Texan again someday. Happy cooking. Lovely, i love a lamb vindaloo. Thanks for sharing this recipe. How much tomato paste? The pictures show it but the recipe and instructions don’t mention it! Sorry, I left it out of the instructions. All fixed now. Wow! We were busy at work, so this (these) four recipes took us 3 nights after work. On night one we made the curry sauce, on night two we pre-cooked the lamb and potatoes, and on night three we made the actual lamb vindaloo! It was really, really good! I am sure we will get faster with practice, but am curious how different the final outcome would be if we just sauteed the meat with a few spices, and chopped the potatoes smaller and pan fried them, also with similiar spices, and then followed the vindaloo recipe? That said, we have a lot to freeze for future meals, and a new confidence with Indian cooking – thank you!!! You could definitely do just as you suggested. It will come out great. Just make sure that the meat cooks until nice and tender. Really glad you liked the recipes. I noticed in your caption on one of the pictures, you used tomato Paste , but it’s not in the recipe below. Should this be added ? If so, how much? Thank you for noticing. This is an updated version of my original recipe and I left it out when typing the recipe. All fixed now. I noticed in one of the captions you mentioned Madras Curry Powder, but I can’t see this in the list of ingredients. Do I need to add it? Thank you for noticing that. All fixed now. You could get away without adding it but it does add to the flavour. I have never attempted to make Lamb Vindaloo before, always opting to order it from an Indian restaurant or get a take away container to enjoy at home. This recipe was super easy, and so delicious. I made it as a special date night dinner for my husband, and he was very pleased and impressed. Thank you for sharing this recipe. Great to hear. Really glad you and your husband liked the recipe. Thanks for stopping by. Just found your website last week, and made Lamb Vindaloo yesterday, along with the curry sauce, madras curry powder, and precooked lamb. It was fabulous, but even though I love spicy food, it turned out more spicy-hot than I prefer. Can you please clarify what type of green chilies you normally use? I had jalapenos on hand, so that is what I used, and because I can never find scotch bonnet peppers here, I used habanero. Thanks for your input. Chillies are difficult as they can vary so much in heat. I use japapenos but I really love spicy food. 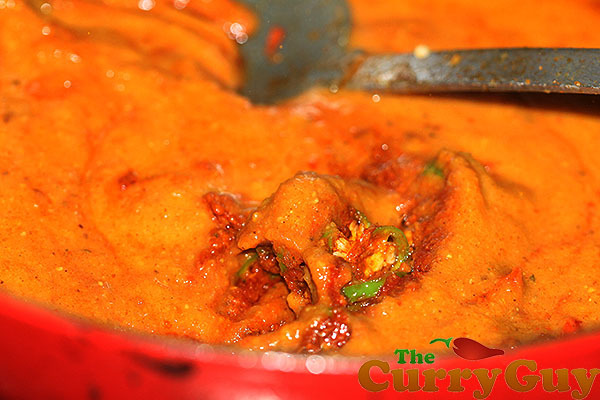 You should perhaps add less at first and then adjust to taste after the curry is finished. It is easy to add more at the end but difficult to cool it down once they are added. Good luck and happy cooking. I’ve made this recipe as written several times now with beef and lamb. It looks a bit time consuming because you need to make 3 distinct dishes in order to finish this one but it’s totally worth it. The base is used for so many things and freezes well, the meat is easy to make on a cold day or while the base is cooking and the main dish is assembled in a few minutes. I’m able to take the meat and base out of the freezer and Cook the whole meal by the time the rice is done. I’ve been adding fewer chillies during cooking but ghost or scorpion pepper purée at the end if I really want to kick it up. the bold flavors really compliment the heat. This is a sure fire winner. Dan I tried to buy your e-book because I like your blog but it’s unavailable on amazon in the states. Anyway we can get it over here as well? I really love this recipe. I’ve made it regularly for several months now and my wife and I enjoy it a lot. I thought I would share my method. Instead of using pre cooked meat I brown lamb(or beef) shoulder cubes, then continue with the recipe deglazing with some red wine. After reducing the wine slightly I add everything else (excluding the vinegar and saving the yogurt for the finish) and simmer covered until tender. The house smells amazing all day. Thanks for sharing the recipe! I downloaded the kindle version of your book too. With fresh scotch bonnet peppers all but impossible to find in my area, could I substitute habanero peppers in this recipe? 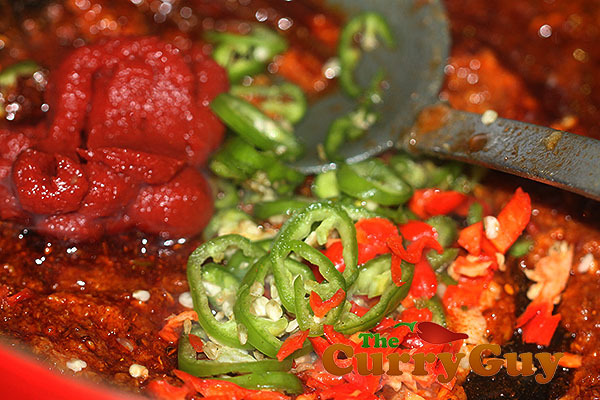 What about using a bottled scotch bonnet pepper sauce? How much of the sauce would equal fresh? Habanero chillies are the perfect substitute. Good to see you’ve studied up on your vindaloo history. 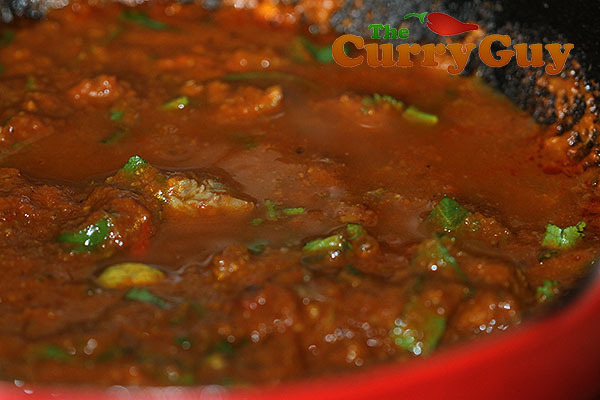 This recipe is for British vindaloo which is different but equally as popular. If you read the post, I do explain this. Lamb Vindaloo… Certainly my favourite Indian meal ..! I did this receipe a few times and the results are fantastic. In Turkey, unfortunetely you couldn’t find so many Indian restaurants and also some indian spices(!) I collected some of they from our abroad travels. Thank you very very much for this gem receipe. You are great! Hi Dan. I made this with prawns tonight. I’ve been cooking BIR style curries at home for more years than I can remember and BIR style Vindaloo is my favourite. I added my mix of finely chopped onions, peppers and some fenugreek leaves to add texture as well as 1tbs of brown sugar and 1 tsp of poppy seeds in with the spices and oh my God it was superb! It was probably the best BIR Vindaloo I’ve ever made and definitely better than all the takeaways! Fantastic mate Cheers! Thank you Steve! Great to hear you liked the recipe. I just used this recipe to make a pork version – I used bone-in pork shoulder which I trimmed of all the fat, boned and cubed and using your pre-cooked lamb recipe used the same preparation method and slow-cooked it overnight in a 200F oven. I kept everything else the same, except being as I’m in California I substituted serrano for the green chilli and habanero for the scotch bonnet. This is the fourth of your recipes that I’ve made and they’ve been a knockout – I can now stop complaining about the lack of BIR-quality food in Los Angeles, it’s coming out of my kitchen! I just ordered your book – if I’ve had a 100% success rate from cooking from your website, it’s the least I can do! At $12 and free shipping it’s the bargain of the decade! Thank you very much Steve for purchasing my cookbook. Hope you love the recipes. Many are similar to those on the site but I’ve learned a lot this year while writing the book. I’m really glad you like my recipes. Much appreciated. Keep in touch. It would have been helpful if you listed “curry base sauce” in the list of ingredients. As someone who has never made a curry dish before, I had no idea to start with the sauce. Frustrating to have cooked the lamb, potatoes, add all the herbs and spices to wonder why the mixture is so dry. Total waste of close to two hours. Sorry you didn’t see it but I do mention it in the intro and there is a link in the ingredients section to the base sauce. If you can help me make it more clear, I am happy to listen. I want my recipes to be as easy for people to cook from as possible. I made the vindaloo but using the recipe from your book and it was excellent, extremely well received. Just one question though, when I stewed the lamb I used a sieve to drain the stock but the lamb had a lot of onion and coriander seeds stuck to it. Do you add it to the curry like that or rinse it again with the stock or something else? Thank you very much Neal. I add them with the meat. It taste great and adds a lot of flavour to the end curry. I’ve scoured the internet for vindaloo recipes and this is by far the best. It takes a lot of time but it pays off. I love this recipe, although i use your home made chicken tikka (which i have mastered perfectly now) instead of lamb. Same great result. Every new recipe becomes my favourite and this is my current one. I dreamt of the leftovers waiting for me in the fridge. I admit I had them for breakfast 🤭🤫. Great to hear Lynne! I love a good curry breakfast. That’s a personal thing and I agree. Always use less if you’re not sure. 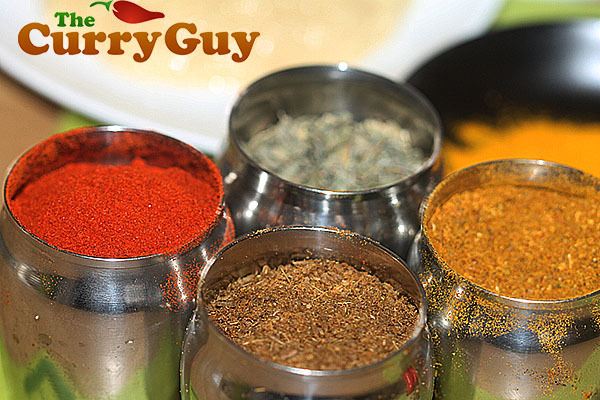 It’s easy to spice up a curry. Very difficult to cool it down! There are so many chili powders to choose from. Cayenne is the first to come to mind. Then there are the chili powders meant for making chili. I normally use Kashmiri chilli powder which is slightly hotter than Cayenne. You are right, there are a lot of different chilli powders. Just find one you like. You will have to experiment. I recommend adding just a little at first and then adding more to taste. You can add the chilli powder any time during cooking. It’s easy to spice up a dish but difficult to cool it down if you add too much. Just be careful. Thank you very much. I’m really happy you like the recipe. By not stirring the gravy, it caramelises to the pan. You can stir this back into the sauce for additional flavour. Good lord, this is the best curry i’ve ever had. I’m halfway through and had to type this. Unbelievable! That’s great to hear. Thank you very much.